In Dancing Cancer, Linda McDonald tells her grandchildren about three types of cancer she has faced in her life, while sharing with them the fulfillment of her dream of dancing. While the title fails to adequately join the two topics, McDonald does indicate that her cancer did not stop her from following her dream. Because of McDonald’s cancer, she was staying with her grandchildren’s family. One grandchild, Alex, asks about her childhood. She explains that she was diagnosed with kidney cancer at the age of three. In addition to describing her medical battles, McDonald relates her dancing experiences, both as a child and as an adult, providing relief from the heavy topic of illness. McDonald—a graduate of Dance Educators of America, Rollins College, and Centenary College—has conducted workshops involving therapeutic exercise and dancing for numerous organizations, including Moffitt Cancer Center in Tampa, Florida. Her extensive advocacy for cancer patients includes participation in the Department of Defense Breast Cancer Research Program as a peer reviewer. The book aims to teach children a few basic facts about cancer and encourage them to pursue their dreams regardless of the setbacks they may face. However, McDonald does not address the fact that achieving their dreams is unrealistic for some chronically ill children. Dialogue is sparse and limited to the first two pages of text. More dialogue, with separate paragraphs for each speaker, and more descriptive detail would help accomplish McDonald’s goal and hold children’s attention. For example, McDonald writes, “Mother and I walked to the train station, boarded the train, and traveled to a big city named Philadelphia for the radiation treatments.” Including dialogue between the author and her mother about how McDonald felt during the trip would have increased the interest level. 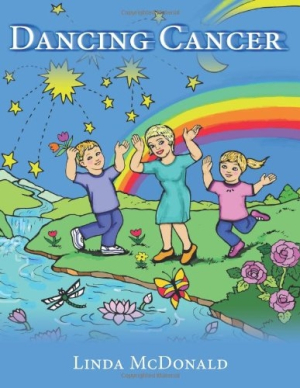 Accompanied by discussion with a parent, Dancing Cancer will help children of various ages understand they are not alone in having a relative with cancer or in having cancer themselves. Christian parents will appreciate religious concepts, such as McDonald’s faith that God has a plan for her life; however, her repetitive use of the words of the song “Jesus Loves Me” is unnecessary. While explaining cancer, the grandchildren’s mother says, “you do not get it if you are bad.” The effort to prevent fear of getting cancer is commendable; unfortunately, this ambiguous sentence sounds like being bad protects against cancer. In most instances, McDonald effectively simplifies medical concepts. For example: “a routine test revealed something was not right.” However, children (and adults reading to their children) would appreciate definitions for words such as mammogram and tumor. Mary Conners’ ten delightful, full-page illustrations in bright colors enhance the text. The cheerful cover illustration, which depicts McDonald and her grandchildren dancing under a star-filled sky, will delight children. It represents fulfillment of one’s dreams.